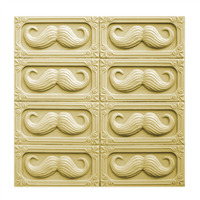 The mustache trend is inescapable, and these Mustache Small Round Molds are a great way to embrace it! Great for grooms, Father's Day and mustache enthusiasts! Mustaches have made a huge comeback in recent years, and not just with hipsters and Magnum P.I. super-fans. The mustache is also the symbol for Movember, a movement to raise awareness of men’s hidden health issues. Create your own line of manly grooming soaps with this charming Tray Mustache Soap Mold, complete with eight cavities sporting a stylish handlebar ‘stache. Make men’s shaving soap bars with this perfect sized bar mold! 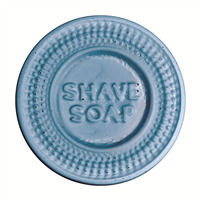 This circular mold has SHAVE SOAP in the middle with a decorative border around the outside.